Do You Want Us to Print a Message on the Inside of Your Card? If you want to have a message printed on the inside of the card, select Yes. If you want to leave the card blank on the inside, select No-Leave Blank. In the next step of the ordering process, you will have the choice to use one of our custom messages which you can personalize or to create your own inside message. All Sympathy Thank You Cards are printed on premium white or ivory linen 80LB card stock, the same weight as a standard Hallmark card. 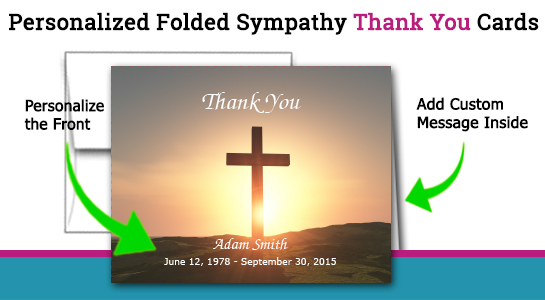 Superior quality Shining Cross Folded Sympathy Thank You Cards from North America’s largest manufacturer of custom note cards for over 19 years. After you complete STEPS 1 thru 3 in the calculator on the left, you will be given the option to design your product online in our design studio. After you click on the STEP 3 button on the left, you will select a phrase for the inside of your card. Once your phrase is selected, you simply fill in the blanks with your loved ones name and life span dates for the front of the card, then sign your name after the phrase you selected on the inside of the card. The Shining Cross Folded Sympathy Thank You card is the perfect way to express your thanks to those friends and relatives that have been so supportive during your time of sorrow and grief. Use the product calculator on the left to get started with designing your Shining Cross Folded Sympathy Thank You card. Printed on heavy 80LB card stock (same as a Hallmark card). 4.25" x 5.5" folded. Easily personalize the front of the card with your loved ones name and life span dates. Easily customize the inside of the card with our pre-designed phrases or insert your own words. Each card is printed in crisp vibrant color using state of the art digital printing. Each card is precision cut and folded. Can ship within one business day.